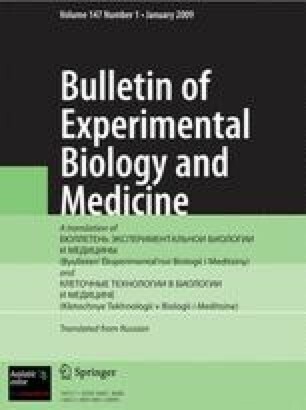 Multicellular formations responsible for the generation of spontaneous pacemaker activity were found in the cusps of the atrioventricular valves of the rabbit heart by means of a microelectrode technique and electron microscopy. Cells of different morphological structure were found: P cells, cells of the Purkinje type, and transitional cells. These formations were found to have a rich innervation, mainly cholinergic in nature. Definite correlation was found between the morphological structure and electrophysiological parameters of these cells. Laboratory of Experimental Cardiology, P. K. Anokhin Institute of Normal Physiology, Academy of Medical Sciences of the USSR. Laboratory of Electron Microscopy, Central Research Laboratory, I. M. Sechenov First Moscow Medical Institute. (Presented by Academician of the Academy of Medical Sciences of the USSR A. M. Chernukh.) Translated from Byulleten' Éksperimental'noi Biologii i Meditsiny, Vol. 83, No. 5, pp. 600–604, May, 1977.